Updated Tuesday September 13, 2016 by PWSC. Many Port Washington Soccer Teams took home silverware in Labor Day 2016 Tournaments! 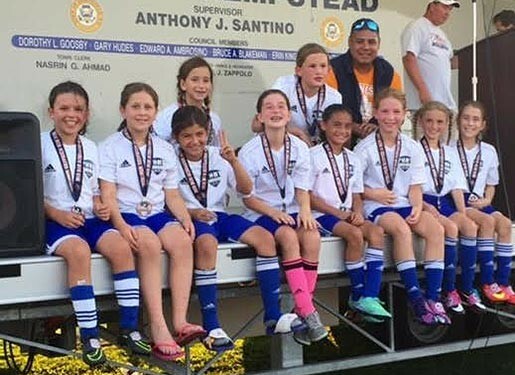 The GU11 Bombers, coached by Eddie Romero, come in 2nd Place at the Oceanside Tournament. The GU16 Sandstorm, coached by Ross Weinstein, took home 1st Place at the Oceanside Tournament with a record of 3-0 (3-1, 2-1, 2-1). The Sandstorm beat two LIJSL Premier League Teams, and one Top 500 EDP team playing up an age group...Molly Krasnoff lead the scoring with 6 goals and an assist. The BU11 Boys, coached by Dan Brotman and Todd Edgar, took home 1st Place at the Oceanside Tournament going undefeated. Boys were relentless in their pursuit of the trophy and demonstrated great sportsmanship. The GU15 Blue Raiders, coached by Dusty Van Cott, netted 2nd Place at the Oceanside Tournament with many girls helping out in goal.